With vSphere 5.5 Orchestrator now ships as an appliance. I had quite a few problems implementing it and wanted to document my process, mostly in case I need to do this again. 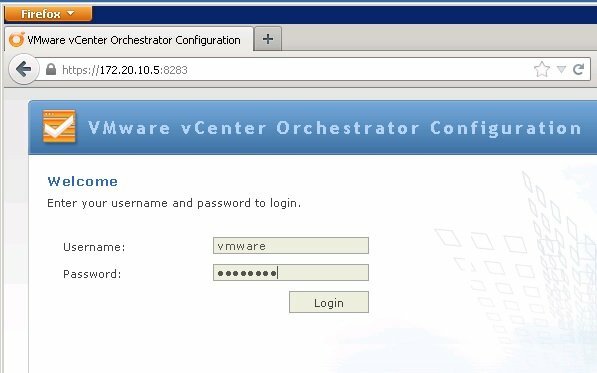 When you deploy the OVA/OVF for Orchestrator 5.5 you will be prompted to accept the EULA and enter a bunch of parameters including passwords for the default “root” and “vmware” users. In my experience skipping any of the fields will blow up the installation and specifying a non-complex password will cause problems later. Neither of those issues is called out during the deployment. After the appliance deploys and powers up you can connect to it using http://<ipaddress> (NOT https://<ipaddress>) which will then redirect you to https://<ipaddress>:8281/vco which server as the “home page” providing links to log into the application (the three links under “Getting Started with..”) or configure the application (“Orchestrator Configuration”). tbd* – you are required to configure the application to authenticate to an outside identity source before these links can be used. 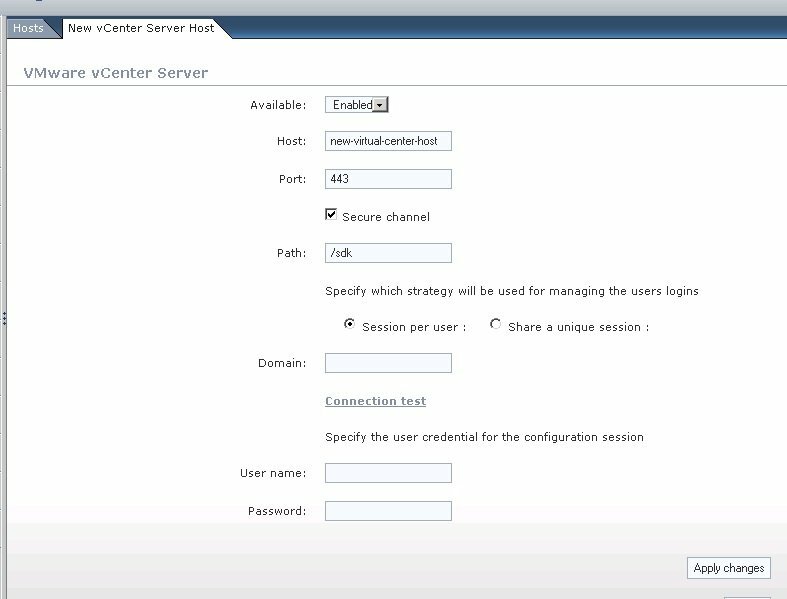 To configure the service to authenticate users as well as connect to vCenter servers you will need to connect to https://<ip>:8283/ with a user name of “vmware” and the password you set for that user during the install. Select Authentication and configure it to authenticate your users. Note that “Root Element” refers to the domain the LDAP server provides names for, “User name” accepts many formats – I use the “username@domain” format. The OUs listed for User and Group Lookup Base must exist. And my favorite, the vco admin group must exist and must contain users. Once Authentication is configured you can test it from the Test Login tab. In my experience you should then restart the service from the Startup Options on the left hand column before trying to authenticate users with the application. 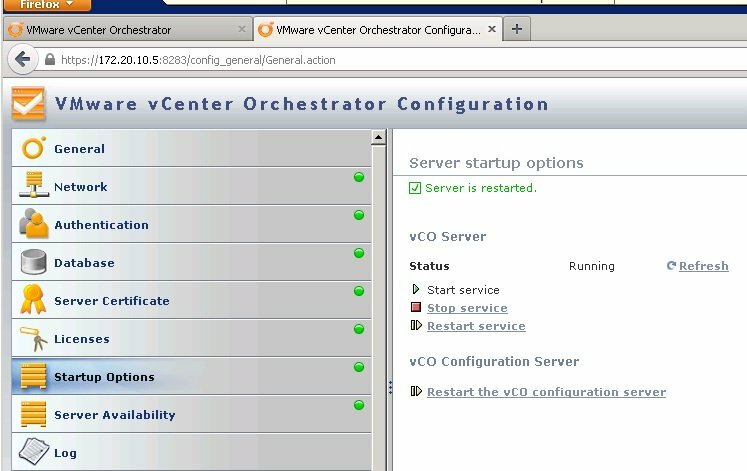 At this point you can authenticate users who connect with any of the options under the “Getting Started with Orchestrator” section of the home page. However you will not be able to access vCenter servers. Click “Import” to save the certificate. 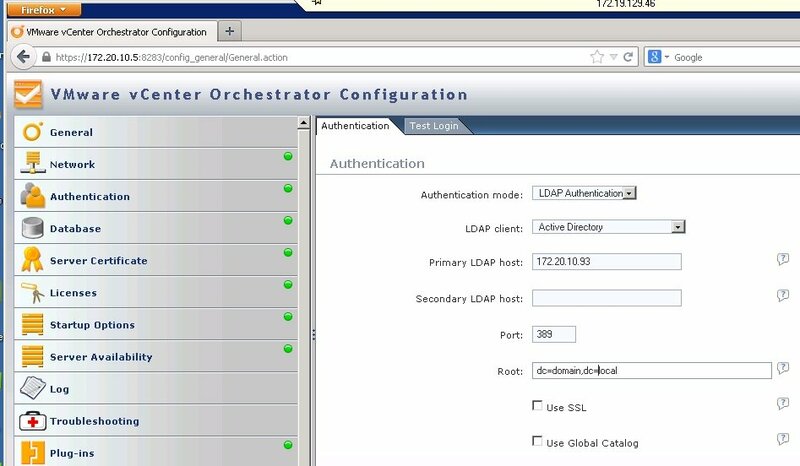 You skipped the previous step to add the vCenter SSL Cert to Orchestrator. You can now ensure Java is installed and connect to Orchestrator as a user with either of the App Admin or App User links above. Note that if you have added Active Directory as your identity source you do not need to specify the domain when you login (ie “Joe” not “domain\Joe”). This entry was posted in Cloud, Computing, Virtualization, VMware and tagged 5.5, Orchestrator, vcloud, vSphere. Bookmark the permalink. Just wanted to say thanks for this was bashing my head against a brick wall. I missed the import certificate part. Very nice. Just wanted to add that you need to add the Certificate using port 443 even if you have already added the vcenter server as an SSO host. Did you look at ?